This 2500 lb. steel cable winch is the perfect size for your ATV! All winches are in stock and ship same day! This 3500 lb steel cable winch has all of the pulling power you need! Order yours now and take advantage of our same day shipping! This 3500 lb. synthetic rope winch is the perfect winch for you! Order today and receive yours within 3 – 5 days with standard ground shipping. This 4500 lb. steel cable winch is one of the strongest winches we offer. Fast shipping so you can have your winch delivered quickly to minimize your down time! This stereo roof from AudioFormz is what you need to set your Polaris RZR apart from the crowd. It features 4 interior and 2 rear facing exterior AudioFormz EVO 6 x 9 speakers that are powered by the 80 watt flush mount marine grade amp. This setup will make your RZR the envy of everyone on the trail! Ride in all conditions with a tip down windshield. Versatile Polycarbonate windshield has two positions – Full up and full down. Position can be easily adjusted with no tools – On the go. Scratch resistant polycarbonate is great in all conditions and is hard coated to resist scratching. Allows for adjustment of air flow when ride conditions change. Keep out wind, rain, dust, snow and any other elements nature has to throw at you with a Glass Windshield. Not only does a windshield protect you from the elements, it can help reduce fatigue so you can ride longer and feel better when the ride is done. Lock & Ride® technology seals it to the vehicle to ensure the most protection possible. Block out nasty, cold wet weather with a Full Poly Windshield featuring easy to install and remove Lock & Ride® Technology. When the weather gets miserable it can make your ride not so memorable leaving you cold, wet and tired. Improve your cab comfort and ride enjoyment by blocking the wind, rain, snow and debris the trail throws at you. 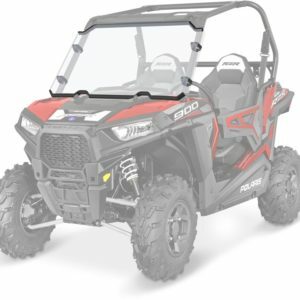 Polaris designed the RZR® Half Windshield to do just enough – provide just enough wind protection, just enough protection from rocks and debris and just enough look-enhancing qualities to make it just right. The design shields you from wind and debris like a full windshield but doesn’t collect mud or dirt so you can always see what’s ahead. Lock & Ride® Technology means it installs easy so you get out and ride sooner. If you’re looking for a synthetic rope to replace the rusted cable on your winch, look no further! This strong replacement rope will not rust or fray like cable which means you’ll be spending more time riding and less time repairing! These are in stock and ready to ship today!